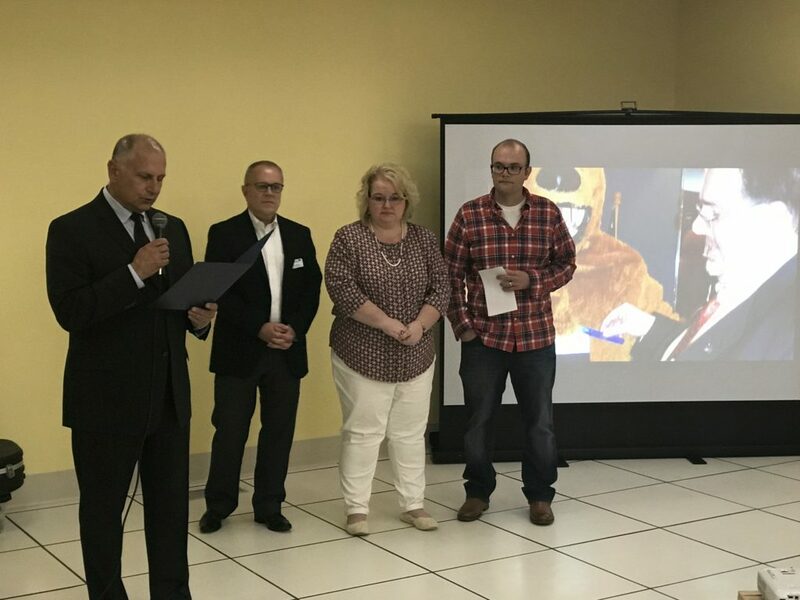 MILTON – The Central PA Chamber of Commerce recently created a training center at its building and named it after the late Bruce T. Smith, Jr., who served as President & CEO up until the time of his death on May 6, 2017. “The Smith Room” was dedicated at 6 p.m. Tuesday, Sept. 19 during the annual Member Appreciation Celebration, an event Bruce started when he became the Chamber chief in 2014. Around 175 people attended the Member Appreciation Celebration Tuesday evening and admired the newly renovated space that is nearly 1,000-square-feet in size. It will be the location of future Seminar & Training Series and Building Leaders for the Susquehanna Valley classes, as well as future trainings that are already in the development stage. Central PA Chamber members will also have the opportunity to utilize the space, just as they do now with “The Ross Room,” which Is also the Chamber boardroom. The renovations were done by T-Ross Brothers Construction, Inc., Montandon. Signage around the door was made by Middle Creek Signs, Beaver Springs. On Fire Promotions, Lewisburg, made the plaque below Bruce’s portrait. “Bruce Smith was a great leader,” said Dale Moyer, Interim President/CEO and Board Chairman, during the dedication. “Bruce cultivated the positive qualities in others and provided support and guidance to family, co-workers, Chamber members and the entire region. The dedication also included a proclamation from U.S. Congressman Lou Barletta, read by his District Director Conrad Falvello. Following the room dedication, a balloon release organized by family and music was held outside. The post T-Ross Brothers renovates training room for Central PA Chamber in memory of leader appeared first on T-Ross Brothers Construction, Inc..